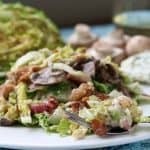 I’m so excited to share this Grilled Napa Cabbage Salad (with Chicken, Blue Cheese and Mushrooms and a hint of bacon) with you! Last week, I woke up in the middle of the night thinking about this salad. While working for Placer County Office of Education as a special education teacher, occasionally our team would go out to lunch after an important meeting and sometimes we would eat at Cafe Bernardo in Roseville, California. This was my favorite thing on the menu – “Warm Napa Cabbage Salad.” It was such a treat! Sadly the restaurant closed a long time ago, but obviously this salad made a big impact with me, since I still dream about it. Their version was much richer than mine and was always served fairly warm. I’m sure it had a ton more cheese and bacon grease thus more calories and points. In fact I looked up a similar version and it was 25 points per serving! Mine is only 9 and includes chicken (which theirs did not). This salad is a great one for summer as you can do most of it on the grill and it won’t heat up the house. I try to have it all prepped if I’m having company and then just pull it off the grill and throw it together after they arrive. Because I barely warm the cabbage, I also think this one tastes pretty good warm or at room temperature. If you like your cabbage a little softer, just leave it on the grill a bit longer. This is a great summer salad as you can grill the onions, mushrooms and cabbage on the grill and not heat up the house. This salad presented a challenge when deciding on a wine that would complement the flavors. Although I love red wine and the salad does have blue cheese and mushrooms, the dressing is very acidic so unfortunately a nice red was out of the question. Therefore, I decided to pair it with a white Grüner Veltliner I had purchased from Chateau St. Michelle-one of my favorite wineries in Washington. You could also pair it with a Viognier or Sémillon. Creamy tangy blue cheese over chicken, warm cabbage, and mushrooms with a hint of bacon. Yum, says it all! It makes the perfect summer salad as you can do most of it on the grill and not heat up the house! Serve it as a main dish or leave the chicken out and serve it as a side dish. In a medium bowl, mix chopped onions and 1/4 c. red wine vinegar. Set aside, allow to marinate at least 15 minutes. Cut bacon slices into 1/2 inch pieces. Fry in a non-stick skillet until done. Drain pieces of bacon on a paper towel. Reserve bacon grease. Make the foil packets for the mushrooms. You will make 2 packets for mushrooms. 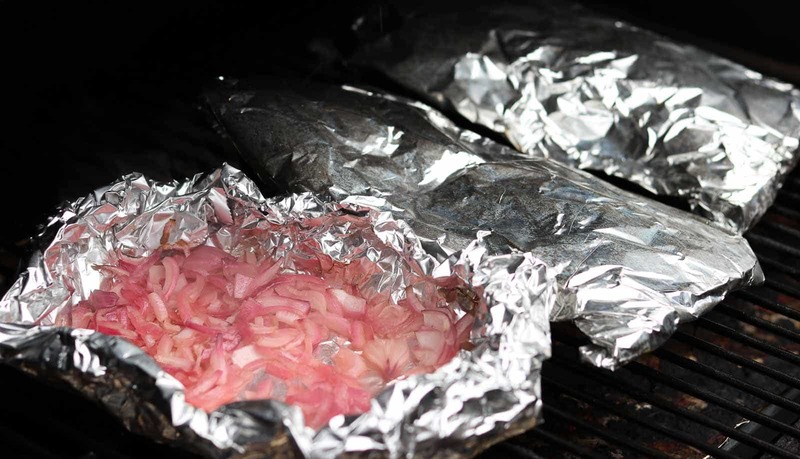 Take a big piece of foil about 34 inches long and fold in half (or use heavy duty foil). Spray with oil. Place 1/2 of the mushrooms on a piece of prepared foil. Spray with oil, fold over and seal tightly. Do the same for the other foil and other half of mushrooms. Make a foil bowl (or use a foil pan) for the onions. Spray the bottom heavily with oil spray. Place onions in vinegar mixture into the foil pan. This will be an open pan, not covered. Grill onions and mushrooms over med/high heat about 10 min, then flip over mushroom packets and stir onions. Continue grilling until done about 15 more min. You basically just want them tender. While onions and mushrooms are cooking, make the dressing. Combine 1 T. bacon grease, 1 T. oil (you can also use 2 T. bacon grease but it increases points to 10 pts per serving instead of 9), Dijon mustard, salt and pepper to taste, 1/4 c. red wine vinegar, thyme, oregano and honey. Use a spoon or an immersion blender to blend the ingredients. When onions and mushrooms are done, take them off of grill but don’t open the mushrooms yet. Spray oil on the cabbage half and place down on grill and grill for 5 minutes. If you like your cabbage a bit more softer (mine is more raw), then leave it on the grill a little longer. Just don’t, “cook,” it. Place grilled cabbage on a cutting board, slice thinly. Add to large bowl. Toss in mushrooms, onions and bacon. Season with salt and pepper. In the same skillet that you cooked the bacon, add the dressing and heat to boiling. Turn off heat and add the blue cheese. Stir until partially melted. Pour over the salad, toss and serve immediately. Unfortunately this isn’t one that tastes great left over. About the Dijon mustard – I go back and forth about the amount. I like it both ways but the Dijon does dictate the salad more if you use 1 T. So my advice is, if you like Dijon, then put the whole tablespoon in, it adds a nice touch but it is a bit strong. If you don’t, then just use 1/2 T.
From my memory, the original salad at Cafe Bernardo’s seemed a bit, “softer.” I think they warmed their cabbage more. You can leave it on the grill a little longer but you don’t really want it cooked too much. If you don’t have a grill: Sauté the mushrooms and onions on the stove. To do the cabbage, warm a big pan on the stove, have everything ready and toss it all in, just be careful not to, “cook,” the cabbage. 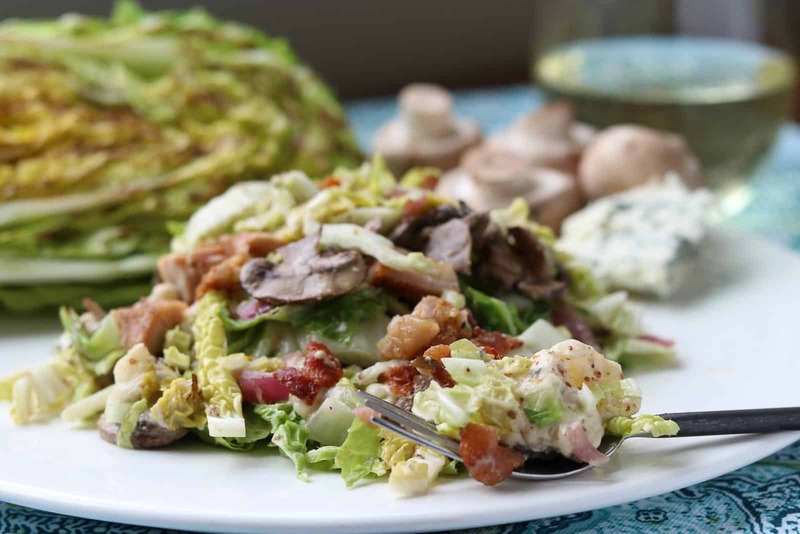 2 Replies to "Grilled Napa Cabbage Salad with Blue Cheese, Bacon and Mushrooms"
I’m so glad you liked it! It’s not exactly the same but definitely not all of the calories either. Great idea to use the cast iron skillet! I love cooking with cast iron. Thanks for the sweet comment!